I am in the privileged position of obtaining access to all my favourite bridal designers for a series of exclusive interviews here on Brides Up North, where they’ll be giving you a sneak peek at their newest designs, sharing the inspirations behind the collections and giving you a glance into their (very beautiful) world. These are the gowns that will be landing in a wedding dress boutique near you soon. Having worked within the fashion industry including working within leading bridal and design houses in the UK and also working freelance designing bespoke bridal pieces for celebrities, designer Wendy Peddlesden and business partner Eileen Prisley decided it was time to create their own brand and Qiana Bridal launched in August 2012. Ladies, what took you so long?! Wendy, tell us about the new collection by Qiana Bridal? What were your inspirations behind this beautiful collection? We have just launched the ‘Classic Rose Collection’ which is our first collection as a new brand and it consists of 18 wedding gowns and two bridal coats. When designing a new collection a lot of my time is spent on the research process by visiting exhibitions and talking to the young future bride to ascertain her aspirations. I think my adoration of the beautiful and glamorous Grace Kelly and Audrey Hepburn are truly reflected in all my designs. Some ideas come to me at night hence the reason for having a pencil and sketchbook by the side of my bed and whilst out for dinner in a restaurant one evening I was compelled to sketch out an idea for a coat on a paper napkin which later became our stunning, tailored ‘Grace’ bridal coat which we recently launched. We plan to create the gowns that brides dream about, with an hint of now, combined with all that’s best from the past — those gowns that taught us so much about elegance, style and great design. I truly believe this statement tells you everything about Qiana. I am inspired by the beauty and romance of the dresses of the 1950’s and also by listening to future brides at consumer exhibitions. This also inspires my designs to create what they are looking for from within a collection. I simply adore the glamorous dresses of the 1950’s and am truly inspired by those famous actors of the time. I have taken inspiration from the great timeless icons like Audrey Hepburn and Elizabeth Taylor who both portrayed British elegance and grace together with the regal inspiration from Lady Diana Spencer and Princess Grace Kelly all of which are truly reflected in all my designs. What sort of woman do you design for? Our collection is designed for brides that love the ‘Traditional English style’ wedding gown, I work with great passion and pride when designing for brides always listening to their thoughts and ideas but always having one ultimate aim in mind which is to make the bride feel glamorous and romantic on her big day. What fabrics and embellishments were chosen for the new collection? All our dresses have been designed and hand crafted in the UK using only the finest silk, organza and lace. I simply adore the soft organza and delicate beaded laces which are all sourced from British suppliers. Do you have a personal favourite from the new collection? I have a couple of favourites in our current collection I love our ‘Megan Louise’ and ‘Dreamtime’ dresses and I also love our new ‘Grace’ full length bridal coat. ‘Megan Louise’ is inspired from the iconic design features of the 1950’s and yet I have complemented it with some fashion elements of today hence the cute lace peplum and ruched silk organza belt and crystal rose buckle. 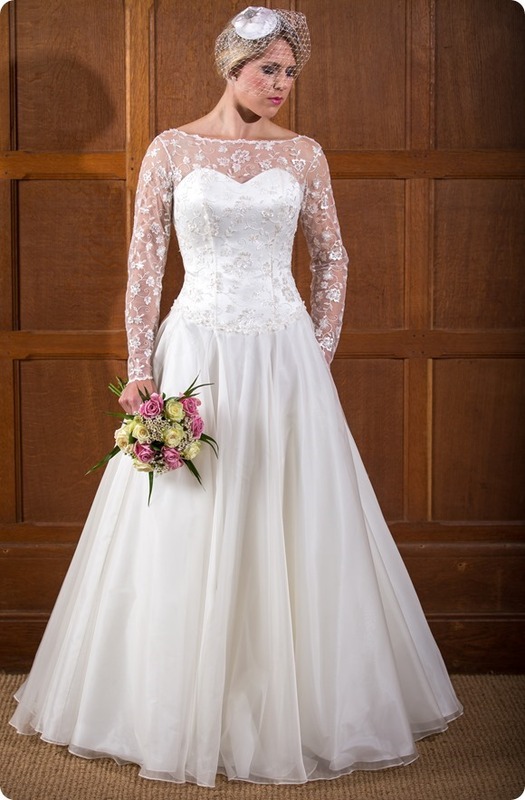 ‘Dreamtime’ is so elegant, graceful and yet is so very on trend with its beautiful sheer lace sleeves and delicately ruched organza belt with pearl and crystal buckle. What jewellery would you pair with pieces from your new collection? On our recent photo shoot we teamed our dresses with either a classic birdcage veil or a traditional bridal veil and then we used very subtle jewellery like pearls and diamonds along with simple hair accessories like hair combs or jewelled headbands. Our dresses are designed so that you don’t need lots of accessories – you only need a subtle elegant touch to complete the look. What beauty look would complement the pieces in your new collection? At Qiana we are lucky to have a wonderful team so before any photo shoot I sit down with our stylist and discuss the look required for our new images. In our latest shoot we reintroduced some of the iconic 1950’s looks using different shades of red lipsticks, clutch bags and pearls. Do you have a “signature” piece? 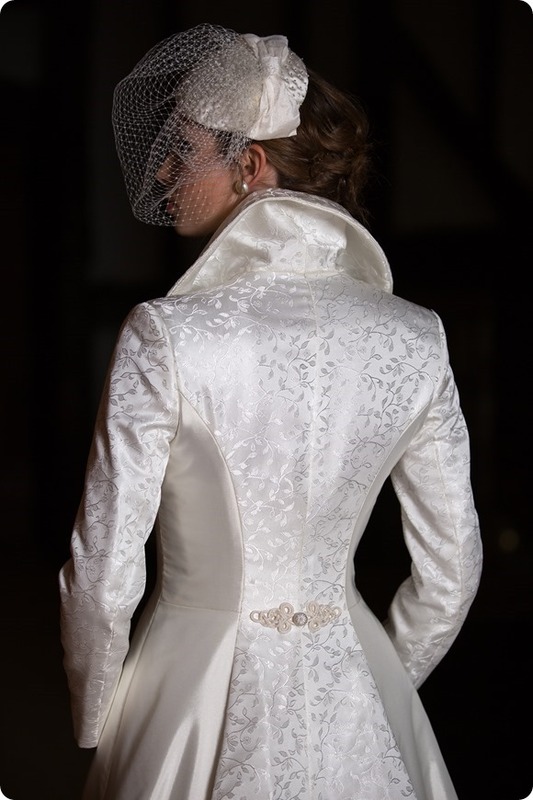 We don’t have a specific ‘signature’ piece however I feel that our Grace coat and Starla ¾ length jacket are great pieces for showcasing the broad breadth of skills that we have at Qiana Bridal bringing together my 30 years of pattern cutting and design experience together with Eileen’s extensive tailoring skills from her training at Norman Hartnells. This allows us to create high quality design and finish in both bridal dresses and tailoring making Qiana Bridal unique in the bridal industry. How do you decide on the “names” for your gowns? As the name of the collection suggests each of our bridal gowns are named after Roses. The reason we decided on this was because the iconic symbol of love is a red rose and also the rose is very iconic to England. What sizes are available in your gowns? Are your pieces made to measure? 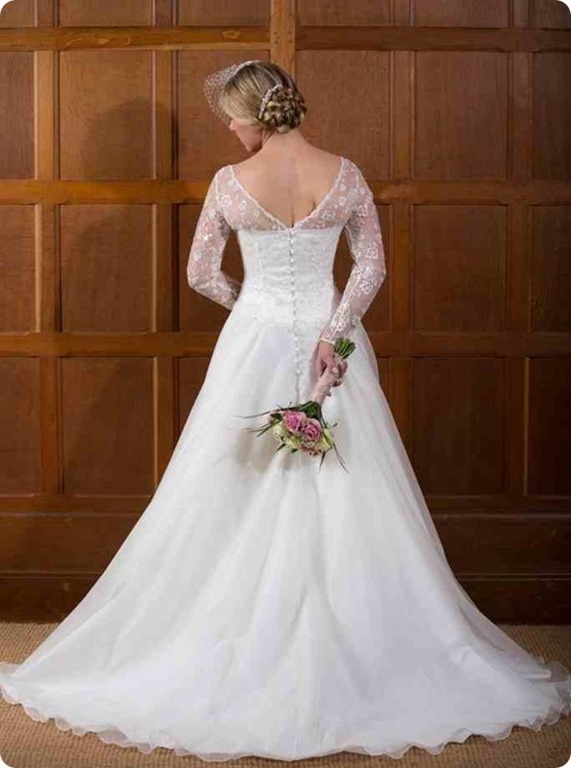 All our dresses are available in sizes 6 – 24 but we do offer a made to measure and a bespoke service as well. What is the process for your clients from finding “the one” to the final fitting? The usual procedure for the bride once they have found ‘the one’ is for a full set of measurements to be taken to ascertain if the bride is a standard size or made-to-measure. Once this is established the gown is cut by myself and then made by one of our skilled machinists who have all been trained by us to our own high standards. The gown is then sent back to the stockist who usually has 2-3 fittings with the bride in order to do any small tweaking that may be necessary. What is the retail price range for your designs? Our dresses start at £2,125 for our ‘Ripples’ dress and go up to £2,686 for our sparkling ‘Darcey’ dress and then we have two bridal coats – ‘Starla’ our ¾ length coat for £2,690 and then ‘Grace’ our full length bridal coat for £3,075. What sets Qiana Bridal apart from other bridal wear brands? All Qiana wedding dresses are designed and handcrafted in the UK using the best of British with fabrics being sourced from UK suppliers. All Qiana Bridal’s wedding dresses and bridal gowns have been produced upon an invaluable knowledge of cut, fit and proportion with flattering impeccable styling. 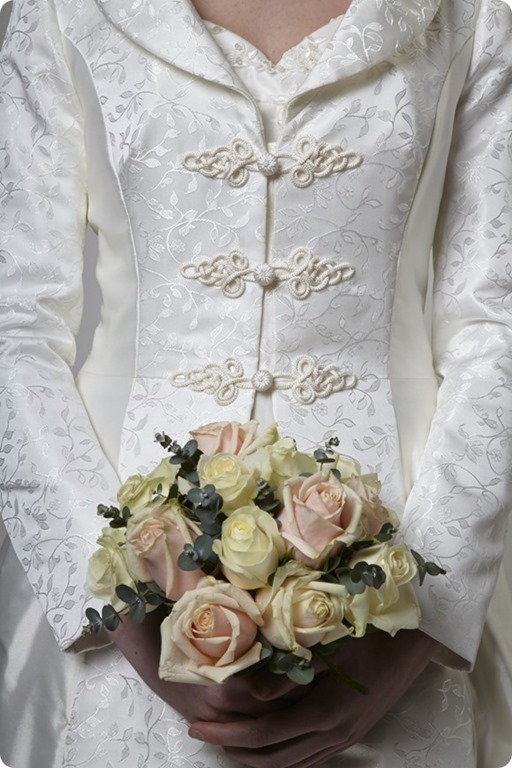 A major benefit for us is our ability to produce high quality tailored pieces as well as high quality bridal gowns which all have style, cut and attention to detail. Since 1990 we have prided ourselves on our ability to never miss a deadline therefore brides and stockists will never be left waiting for a dress. 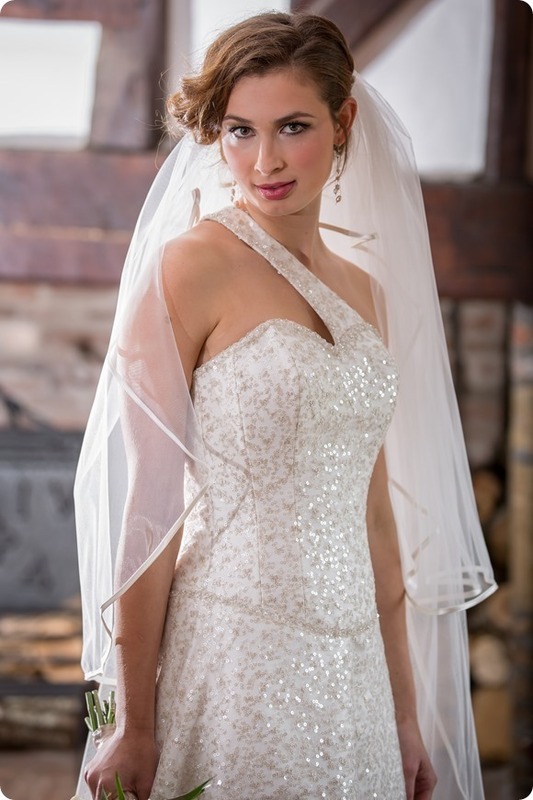 How did you get into wedding dress design – what is your story? I have over 30 years’ experience designing. I originally did my training at the London College of Fashion and on finishing my studying was employed by the B.B.C. Costume Department. I have worked for leading London couture houses and worked freelance to Bridal for the last 12 years. My business partner Eileen originally served a tailoring apprenticeship at Norman Hartnell in London where she made several coats and suits for the Queen, the Queen Mother and Sarah Ferguson. Qiana was originally launched in the 1990s and for over 10 years we provided exquisite, tailored clothing for stars like Dame Judi Dench, Sir Tom Jones, the Spice Girls for their ‘Spice World’ Movie premiere in both London and New York, Daniel Craig and Ruby Wax amongst others. To this day Qiana still continue working for its original market the TV and film business including making pieces for ITV show ‘Mr Selfridge’ and BBC drama ‘Luther’. Qiana Bridal launched in 2012 with our first collection the ‘Classic Rose Collection’ and now serves an entirely new market within the bridal industry after having designed and made many bespoke Bridal dresses during the past 20 years. Was there a defining point in your career that made your business the success that it is today? There has been no specific defining point but we have been totally focused on building a team of talented people who are all committed to moving the company forward. We have been very lucky to have received a lot of support from people and the industry media. To work together with retailers and stockists to build upon and grow a firm manufacturing base in the UK – let us fly the flag for Great Britain! Is this your dream career? Yes it all began when I won a national dressmaking and tie-dye competition at the age of 15. From this time I knew that I wanted to design, cut, fit and make clothes as a career which has taken me to the top end of couture. For this I am so very lucky and yes I do still have that dress! What would “a day in the life” at Qiana Bridal HQ be like? I am constantly busy planning future shows, visiting outworkers, sourcing fabrics etc. but I collate my thoughts to create new designs when working in my studio. Where do you go and what do you do to relax? It is not easy to ‘switch-off’ so we get ‘away from it all’ by going on short weekend city breaks. I also love to walk regularly the seven mile walk along the seafront near to my home listening to the therapeutic noises of the sea and breathing in the salty sea air. What are your “best things” in life? My family are most important to me and have always been very supportive throughout the whole of my career. How can Brides Up North readers get in touch with you or see more of your designs? The wedding dresses very beautiful!